A three night base camping trip to Algonquin Park’s north end: Access#29 - Kiosk. A two hour drive past Huntsville. Late June can be a fantastic time to visit Algonquin Park; The days are sunny and long and the lack of people makes for a solitude filled trip. 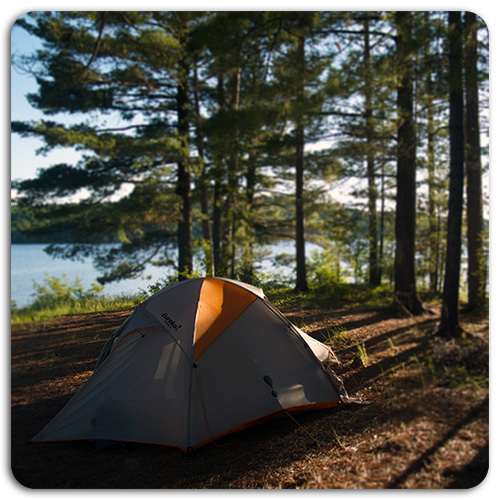 June can also be the worst for bugs; We’ll select a breezy, open campsite for you to minimize the threat from bugs. To take the sting out of June camping, there is bass fishing on opening day along with the traditional fish fry afterwards. To escape the bugs & heat a day-trip to waterfalls is also planned. We’ll show you how much fun and rewarding camping in June can be! There is one date planned with room for only 6 guests - You’ll have to book fast if you want to get in! A three night/four day base camping canoe trip into Algonquin Park’s interior. This package is meant for campers inexperienced with backcountry camping. This is a seven night/eight day canoe tripping excursion occurring in the months of July & August. You will enjoy this trip more if you are prepared for the challenges that an eight day trip offers; Daily breakdown & set-up of camp, travel of at least 6 hours per day in all weather conditions. This type of trip is well suited for those that seek adventure and summer fun and are capable of physical activity every day for a length of eight days. By the end of day 3, you should be comfortable in the daily life of canoe camping and by the end of the trip - You’ll be a pro! A nine night/ten day canoe trip from Access#3: Lake Magnetawan. 1.5hrs past Huntsville. This type of trip involves daily breakdown & set-up of camp, everyday. Multiple portages each day will be traversed with 4-5 hour tripping days planned. A rest day will be factored in as well. 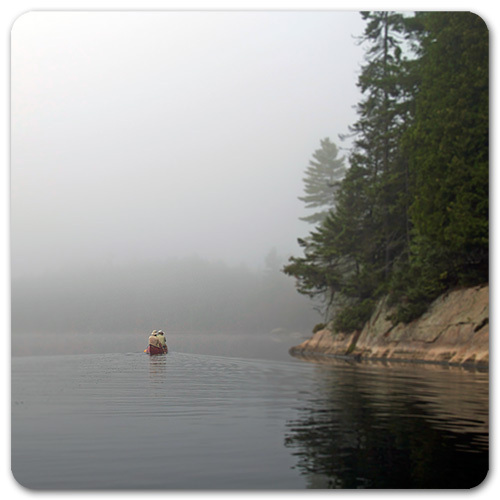 Mid-September is prime-time paddling, with gorgeous mornings filled with mist and cool nights around the campfire. With the lack of bugs and people, September is the perfect month for paddling! Build memories of a place so fantastic it has been described as “Heaven” by many. Join us and you’ll see why! 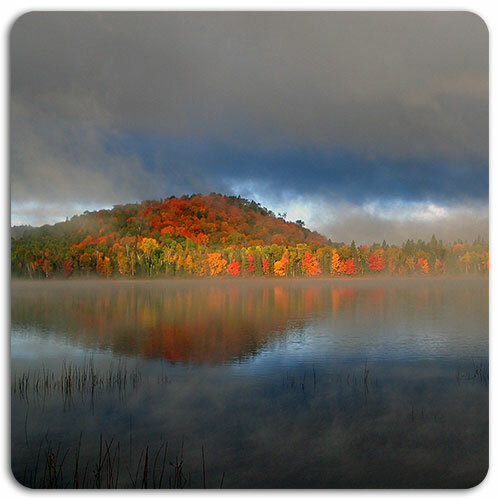 A late September or early October canoe trip in Algonquin Park is awesome! No bugs, no people, warm sunny days, cool nights by the fire and the maples ablaze in their autumn glory. If you are a photographer or an aspiring one, this is the time of year to explore the backcountry with your camera. With the photographers’ needs in mind, this trip is a ‘mobile’ base-camping trip. Moving camp every second day will provide our guests the opportunity to explore and photograph a variety of locations in Algonquin Park. We can design private custom tours for you and your group. From one person up to a maximum of eight people. Length of the trip can be from 3 days to 23 days maximum. Tell us what you’d like to see and do; i.e. moose, fishing, waterfalls, lookouts, hiking, etc and we’ll get you there. Ever wanted to get away, I mean really get away from it all? TV, the connected world, crowds and NOISE? If you have the desire, you probably have the need - A need that has been unfulfilled. 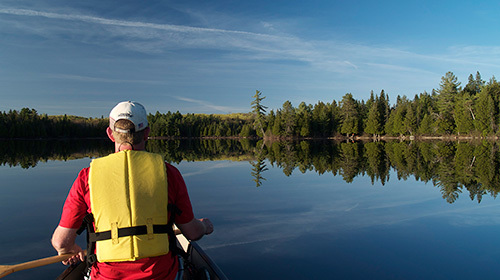 A guided canoe trip in Algonquin Park is the answer! 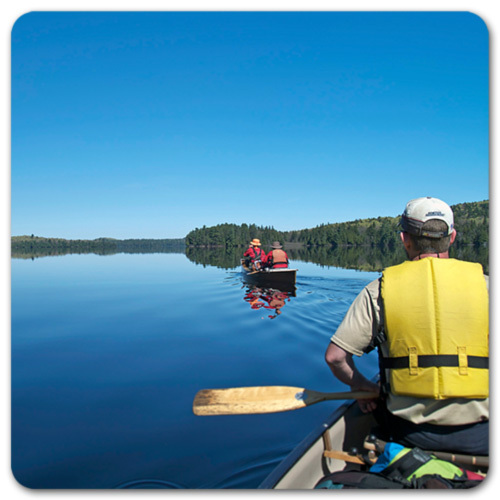 Canoeing in Algonquin Park has been known to have positive influences on people. Being physically active is part of the canoe camping lifestyle and it can fill people with spirit - As they learn more about the outdoors and canoeing, they begin to learn more about themselves and their abilities to adapt to life in the great outdoors. Such gratification that comes from personal achievement in this regard cannot be attained in an urban environment. Certainly, not possible in a noisy, connected & crowded world. Algonquin Park offers a chance for the the traveller to go back in time to a simpler era, when humans relied more on themselves and their wit, rather than the technology of today to get them through the day. The solution we offer is thus: Solitude! For adults we offer flat-water canoe paddling only. No high intensity, adrenaline pumping rapids. We will take you to places where the noise factor is low and the solitude factor is high. By the end of the day, as evening approaches, a campsite will be selected for you and the party to offer the best in solitude and rest from the day’s journey. All guided canoe trips will have a maximum party size of six guests (8 guests for private tours) and up to two guides. We like to keep a party size small - In this way each guest will receive more attention, while maintaining a sense of solitude that is not possible with larger groups. 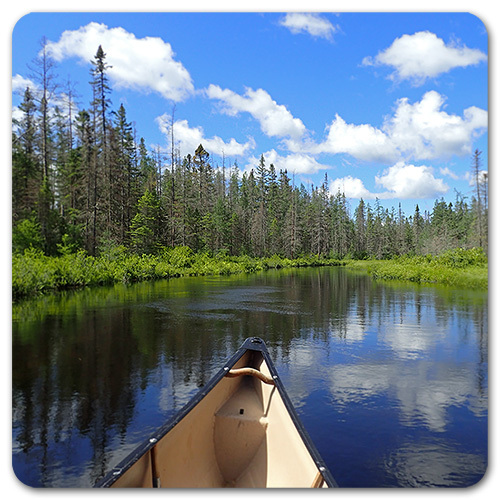 Enjoy your trip as we guide you along the waterways and through the forests of Algonquin Park. Of course it isn’t all easy - You might have to slap at a few bugs and wipe sweat from your brow, portage a canoe or carry a pack, but it is all part of the fun and learning of canoe camping. Once camp is reached your hard work for the day is done. Our hard work continues: Camp in luxury and eat like a “King” as our guide(s) fawn over your needs at camp. Dinner and breakfast is served by us and while you sit back and enjoy your meal we will do our upmost to make your life around camp relaxed & comfortable. Light lunches on the trail or in the middle of a lake are also provided. Everything is included. All you need to bring is yourself, your personal kit and suitable clothing. 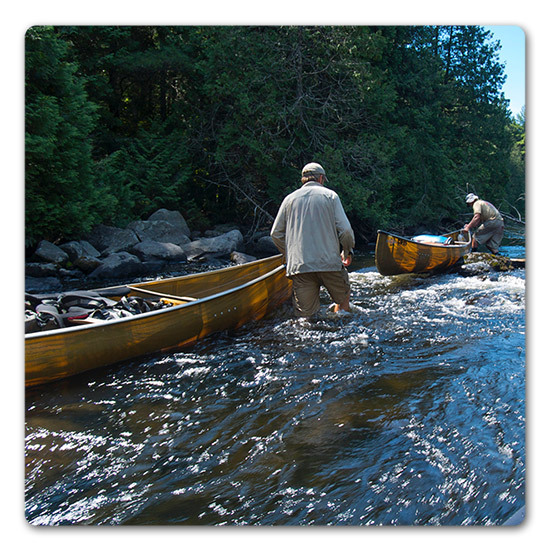 A full list of what is included is detailed in each canoe trip package. As well, once a reservation is made, you’ll be advised what you should bring for yourself; i.e. Personal kit items, camera, sunglasses, etc. * Canoe trip packages are priced per person in Canadian funds. Taxes (13% HST) are extra.